Part of our mystique is the homey atmosphere, theatrical lighting and youthful feelings, which are inspired by our crayons and butcher paper table coverings. The artwork that surrounds our dining room was drawn right on our tables by customers. We are also known for our big round tables that can accommodate large parties and promote a fun party atmosphere. We have many signature items that customers come from all over to try. Our marinated Romanian Skirt Steak, 44 oz. Porterhouse Steak and Roasted Country Chicken are just a few of them. We also have a great reputation for Prime Aged meats, such as our New York Strip Steak, Marinated Strip Steak and 26 oz. Bone-In Strip Steak. Our meats are hand-selected by Frank’s Steaks’ very own butcher who provides the best center-cut meats from prime aged beef. We also have a signature steak sauce that is so beloved by customers that we even sell it to the general public.  The Frank’s Steaks logo is always followed by the quote “We Ain’t Just Steaks,” and for good reason. We also have the freshest quality fish, straight from the Fulton Fish Market. Our Salmon Filet entrees and Tuna Steak specials are comparable to any of the best seafood restaurants around. Our Shrimp Cocktail is extremely popular. We put five jumbo Ecuador White Shrimp around a huge goblet that’s filled with lettuce, cocktail sauce and horseradish. Another unique, fantastic appetizer is our Cajun Calamari with Cajun Roumalade. We also serve a large quantity of Teriyaki and Roasted Chicken, considering that steaks are our claim to fame. Additionally, we always offer a variety of specials. Frank’s Steaks has an extensive wine list that includes many highly-rated vintage and reserve bottles. All of our wines have been well-researched and tasted by our team of experts to ensure ultimate enjoyment and drinkability. Our knowledgeable staff is always happy to assist you in choosing just the right wine to compliment any meal or occasion. Frank’s Steaks has a wonderful choice of tap beers, reflecting the current trend and popularity of micro-brews. We frequently offer newly-released micro-brews to keep it interesting. Our bottled beer selection includes the most popular brands of domestic and imported beer on the market. At Frank’s Steaks, we are known for our huge dessert portions that can easily be shared by two! It is always fun to see the reaction of our customer when we serve our mile-high triple chocolate cake, gigantic apple cobbler a la mode, or bottomless bowl of cheesecake. Our desserts are made in-house to ensure their freshness and quality. We encourage you to enjoy them as a great way to end a wonderful meal. We are also recognized for our professional, courteous and knowledgeable floor staff, beginning at the front door with the hostess/host and carrying over to the wait staff, bartenders and busboys. Our staff bends over backwards to please our customers. We also try to honor all special requests. After working his way up from waiter to management, Chris is now the Managing Partner and one of three principal owners of Frank’s Steaks’ Rockville Centre location. His passion for the business and his desire to create an elite dining experience for everyone is evident in how he treats staff and in how he warmly welcomes everyone who walks through the doors. Chris goes on to say, “I love having a hands-on approach to the restaurant, because I’ll never forget where I came from or how I started in this business.” His philosophy for excellence is to have everyone keep on doing what they do best, while also implementing new ideas that keep up with modern dining trends. While the restaurant, and Chris himself, are like throwbacks in a modern day world, they are also staples in it. There’s no greater privilege for Chris than being the “Face of Frank’s Steaks,” and spending time with his restaurant family.